Bira's Ankur Jain has swiftly carved a niche for himself in a difficult domestic alcoholic beverage industry. He is far from done yet. While growing up, Ankur Jain never thought he would one day lead a start-up in a sector considered to be the toughest for new entrants in India-liquor. Beset with archaic state regulations and an overwhelming lack of transparency, the alcoholic beverage industry in India is not for the faint hearted. Born in a middle class family of professionals in South Delhi-his father is an architect, mother an interior designer-Jain was an above average student deeply passionate about technology. He followed the usual script till college and graduated with a computer engineering degree from the Illinois Institute of Technology in 2002. Following a blink and you miss stint at Motorola, the entrepreneurial bug first struck him when he started a healthcare information start-up. "I always wanted to start something of my own. The drab routine of a job is not for me," he says in his usual matter of fact manner. "I did not really encounter any resistance from back home. My parents may not be entrepreneurs in the strict sense, but from my mother's side my extended family is quite entrepreneurial. So it is not an unheard of thing." When he returned to India in 2007 after selling off the healthcare start-up that had reached its inflection point, his own fondness for beer turned him into a brewer. "When I returned to India, I could not get even one beer that tasted good," he says. "That is when I thought it made sense to bring to this market good tasting beers." Over the next few years, Jain imported some of the craft beers that he loved during his time in the US. The concept of craft beers-loosely defined as those that are brewed in small quantities by standalone independent brewers-was nascent in India a decade back. Add to that the complexities of the Indian market-each state has its own liquor laws and taxes-and odds were stacked against the challenger. 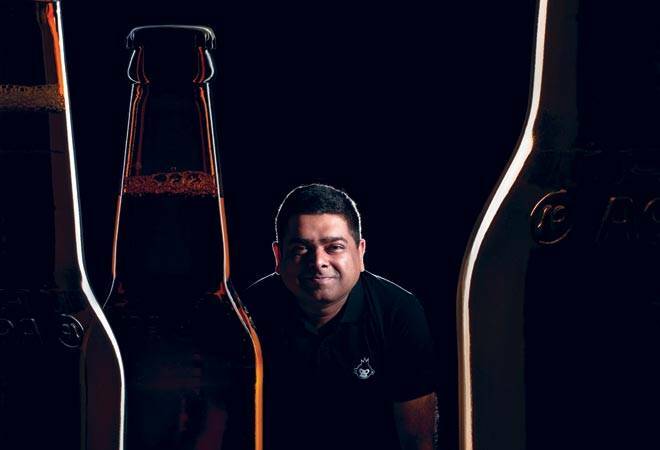 Yet, Jain stood firm and after gaining enough knowledge of the market, consumer tastes and price elasticity, he settled on two staple beers-a wheat beer, Bira White, and a lager, Bira Blonde-to launch his own bottled craft beer firm B9 Beverages in 2015. Initially brewed and imported from Belgium, the wheat beer in particular was an overnight success. "The benchmark for beer in India is Kingfisher. So it is not really very difficult to make better tasting beers." The kind of growth Bira has been able to achieve in the domestic market is unheard of in the Indian alcoholic beverage industry, hamstrung by its inability to advertise. Jain relied heavily on word of mouth publicity where the novelty factor of his beers worked wonders. He also imbued the brand with a youthful character with a mischievous monkey as his mascot. In its first year, the firm sold 150,000 cases of beer-each case is equivalent to roughly 8.5 litres. The following year in 2016, sales went through the roof to more than 700,000 cases. Last year, it quadrupled to nearly three million (30 lakh) cases. In 2018/19, Jain wants to double sales to six million cases and clock revenues of `450 crore. It is not like Jain has had a smooth sailing all this while. In the middle of 2016, just as Bira was gaining momentum, a miscalculation led to a shortage of beer at the outlets, never a good thing in a market where consumers are spoilt for choice. It had been over a year that Jain had been importing the beers from Belgium but as the brand gained critical mass, he wanted to brew it locally and bring down prices. A deal with a brewery in Haryana fell through late last year creating the mismatch in production and demand. He recovered quickly enough and leased a local brewery in Indore in Madhya Pradesh within months to restore parity. Local production also led to the expected drop in prices. When launched, a 330-ml pint of the beer cost anywhere between `170-220 in different markets. Prices are now down to `90 for a bottle of Bira White in Delhi. The reduction led to the kind of demand upsurge that the company has seen over the past few years. Jain is mindful he cannot make the mistake of under-estimating demand again and the market would be less obliging next time. Last year, he leased another brewery in Nagpur and is on the verge of finalising the deal for a third one in Alwar. At the same time, he is also building his own greenfield brewery in Mysore that would be operational by the end of 2018. Jain is eventually looking at an overall capacity of 12 million cases per annum. Recently, he has also started brewing in New York to service its operations there. Jain has also expanded his portfolio by adding two more beers, a strong and a low calorie variant, last year. He has also added a pale ale in the process. He says he would launch at least one new beer every year. Some early fans of the brand, however, have noticed a change in the taste of the beer and have begun to move away. Ankit Mishra, 28, who works in a bank at Rajiv Chowk in central New Delhi and is an avid beer drinker, says he is not hooked on to Bira anymore. "Maybe the novelty factor has worn off but the Bira White doesnt taste the same anymore," he says. "I was one of the early adopters of the brand and have introduced it to my entire friend circle. I dont look out for Bira anymore now. Between one bottle to the other it doesn't taste the same." Has Jain taken his eyes off the ball and has the quality really suffered? "When he brought the beers from Belgium, the product was exceptional and that is where he got the acceptance," says Sandeep Bhatnagar, Director, Ambicon Consultants, that helps set up microbreweries and brewpubs. "Unfortunately, when he started brewing it here the quality has really suffered and he needs to be very careful of that. It would be very critical for survival in a tough market. I do not think water is a factor. May be they compromised with the ingredients because they wanted to bring the price down. When you go to overseas markets, which are very mature, quality will be even more essential." Jain plays down the talk of change in the taste of the beers and says the difference in water between Belgium and India has nothing to do with it. "It is not (a question of) Belgium versus India. There is technology available to replicate water back to its source. We have ensured quality standards are at par if not better than in Belgium," he says. "On the contrary, because the beer is being brewed here, it is very fresh. Overwhelmingly the response from customers has been positive on the taste. Most of the complaints that we get on social media are regarding availability or the lack of it. Beer is a perishable product so from a batch to batch the taste may wary." Even as it makes a name in India, Bira has plans of globetrotting as well. It is already exported to New York and New Jersey in the US-Jain wants to expand it to Philadelphia and Boston. He further wants to tap the market in Singapore, Bangkok, Hong Kong, UK and Dubai. For a barely three year old start-up, it seems he is in too much of a rush. "The big boys are so big that we need to scale up very quickly if we have to compete with them," he says. "Next year we are hoping to triple our sales. If we drop down to a say 20 per cent kind of annual growth rate then I don't think we will get anywhere." The Kingfisher isn't quite in sight, but Bira's monkey is ready for bigger leaps.